Well, we did get to go sailing on Seneca Lake on August 19th. When the tug C. L. Churchill pulled the schooner off the dock in Geneva at 9:15 in the morning, the lake was a mirror; not a breath of air stirred. Keeping the faith, we set full sail, the big mainsail , the foresail amidships, and the little jib, up forward, and cast off the tug. Visitors often ask us about crew size. We explain that because canal schooners were family affairs, the crew was the family. “Well,” we add, “if there were no children, or the children were too young to work, they might hire one man to help out.” And then we say that we have a crew of up to a dozen, not so much to handle the McClure, Churchill, and Oocher (our outboard-powered, inflatable boat), but more to provide enough interpreters to translate our vessel of 1862 to people of 2010. But I have to say that our big crew makes setting sail relatively easy. Still, it’s a half hour of strenuous hauling on the halyards, rigged with slow-but-sure block-and-tackle, to get our sails set, with the main and fore gaffs peaked up at just the right angle. On this day, our sailsetting efforts were rewarded by a breeze that could only be described as light and variable. We used all the wind there was to tack and reach back and forth for a few miles in the north end of the Lake. At times we had bare steerageway, moving just enough so that the rudder could make the schooner respond and turn. I think we may have gone at the breathtaking speed of four knots for one ten-minute period. It is only human nature for sailors to wish for more wind when it’s light (and less when a gale is blowing). We were satisfied with our tiny breeze, however, because the feeling of the schooner moving quietly under sail at any speed is always delightful. And once again, we could marvel at the canal boat’s amazing maneuverability at slow speed. Few traditional schooners can match the Lois McClure’s ability to turn through the wind from one tack to the other in such conditions. The Seneca Lake pleasure boats that approached for photos carried folks who called over their great appreciation of the chance to see the McClure under sail. We needed to be back on the dock by mid-afternoon to disembark crew traveling to Basin Harbor to conduct this year’s “Rabble In Arms” spectacular back at the Lake Champlain Maritime Museum. So of course, no sooner did we round up and shake the wind out of our sails to stop and take the tug alongside, than a fine breeze sprang up from the West, making a perfect reach up and down the lake. Aeolus, the wind god, was certainly being perverse. Never mind; we furled up and towed back to our Geneva dock. And the citizens of Geneva swarmed on board for the next three days, August 20th through the 22nd. Well, they didn’t exactly swarm on the 22nd; it was more like swimming through that day’s deluge. In the three days, we counted 1,700 visitors! August 23rd was a lay day. We had bowsed down the shrouds before sailing, tightening the wires that support the masts by pulling hard with a “come-along” (today’s version of the block-and-tackle) on each part of each lanyard in turn, the lanyards being the heavy lines led through the round, wooden deadeyes, the combination connecting the shrouds to the deck. In spite of the light breeze, the lanyards had stretched remarkably during our sail, so on our lay day, we bowsed them all down again, because we were to sail again on the 24th. One of the reasons sailing is so interesting is that no two sails are alike. There is always a different breeze, in direction and strength and character. Well, almost always. For our second sail on Seneca Lake, my log recorded the breeze as “light and variable.” I’ve never known two days of sailing to be more alike. We got to enjoy the schooner under sail all over again. August 25th found us back at Stivers Seneca Marine, where we struck the rig, stowing the masts, booms, gaffs, and sails back in their horizontal position atop the T-braces. 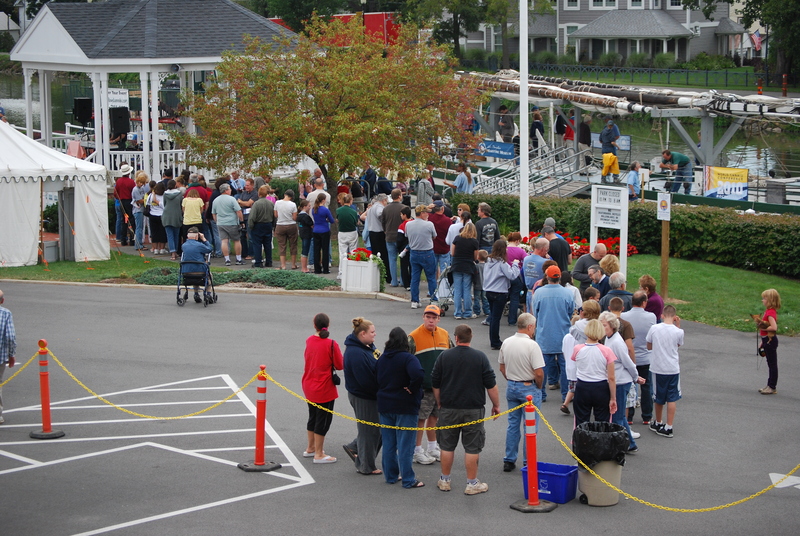 Late that afternoon, we towed through the Cayuga-Seneca Canal to Seneca Falls for a repeat visit. We had called at Seneca Falls in 2007, but you’d never have guessed it on August 27th by the great turnout we had this year. On August 28th, we re-entered the Erie Canal and headed west. When we traversed this section of the Canal in 2007, we had found ourselves, early one evening when it was time to stop for the night, approaching a village called Clyde. There was a wall at which to moor, so we did. We could see a few houses, but the main part of the village was out of sight. We settled in for a quiet night. Or, were just about to, when at least two dozen excited citizens materialized and began exclaiming over our vessel and asking all sorts of questions about her. When these Clyde folks learned what we were about, it took them but little time to extract a promise from us that when next we came out the Erie Canal, we would schedule a stop in Clyde and open the Lois McClure to them. On August 29th, we fulfilled this promise. From this small village, 350 visitors came on board to see at firsthand the sort of life ancestors of many of them had led along the Canal 150 years ago. We towed on west to Newark on August 30th. This was a town we’d had to bypass in 2007, so it was good to make it a port-of-call this year. Realizing what an asset the Canal can be to a community, Newark has installed a first-rate mooring wall, with fine facilities for the crews of boats. We were treated to a concert and a good crowd of visitors to the McClure, eager to learn her history lessons. On September 1st, we were getting into Charlie Copeland territory. Charlie loves to ride his bicycle along the Erie towpath, and in 2007, he had followed us for many miles. When he arrived in Newark on this day, we shanghaied him, bike and all, and he “rode” with us to Palmyra, first agreeing that these miles would not count on his yearly total of miles pedaled. In 2007, the citizens of Palmyra had outdone themselves in providing all sorts of hospitality for our crew. I guess that’s just the way they are; in 2010 we couldn’t lift a finger to cook a meal and only had to hint at the need for a ride to get ice to find a vehicle honking, ready to go. Steve and Bonnie Hays, in particular, are indefatigable, and once again, we took Steve “off the streets of Palmyra” to volunteer in our crew. The trip from Palmyra to Fairport on September 4th challenged us with a headwind out of the West that gusted to 30 knots at times. (Charlie Copeland was with us again; I’m sure he can ride faster into such a wind than we could carry him, but we did save him effort.) The challenge comes mostly when leaving a lock. Once we get good headway, we can steer into a strong breeze okay, but when we start slowly out of a lock, the wind can take charge of the bow and blow it off to whichever side it pleases. We have been reluctant when exiting a lock to have the Oocher tied onto the bow to push or pull it sideways for fear the inflatable, with its two crewmembers, could get squashed between the schooner’s bow and the lock wall. But after having the bow blow off and nearly ashore exiting Lock 29 before we could get the Oocher tied on to pull us safely away, we decided to risk keeping the Oocher right on the bow as we went out of the next lock. In Lock 30, this technique worked beautifully; the Oocher kept the schooner heading where we wanted her to head, by pulling the bow up against the wind as we went slowly ahead on the Churchill’s propeller. The fine mooring in Fairport is right in the center of town. It’s a 100-foot walk to good ice cream. Mercy. We’d had a good visit here in 2007; this year was another, with nearly 1,000 people tramping up our gangway ramp! It was on to Spencerport on September 6th. This was our first visit, and the citizens proved their enthusiasm by coming on board that evening and the next day to the tune of 1,100 souls. On September 8th, on the trip from Spencerport to Middleport, we passed under eleven lift bridges. 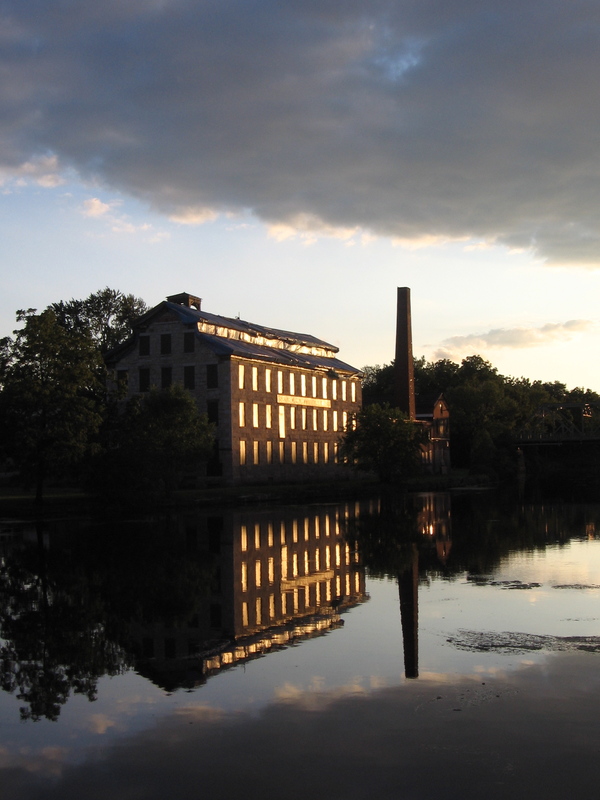 These handsome structures are original to the nearly-century-old New York State Barge Canal. The span of a lift bridge clears the water of the canal by only a couple of feet when the bridge is lowered. Vehicles cross the bridge right at street level. When we approach a lift bridge, the drill is to wait for the bridge to come in sight and then radio the operator on Channel 13, just to be sure he or she sees us coming. He or she always does and says, “Just keep on coming. I’ll have the bridge out of your way by the time you get here.” We thank him or her and press on toward the bridge. Our majestic five knots seems to get faster and faster the closer we get to the bridge. Just when we’re about to chicken out and slow down, we hear the bells ringing and the bridge lifts horizontally with time to spare. These bridges are beautifully designed and engineered. At each end of the lifting span is a heavy counterweight in a tower, so that the electric motor that does the lifting need not be powerful. The bridge span has sidewalks on each side, and pedestrians can mount the towers on stairs and cross the canal with a nice, high view as long as the bridge remains up. The schools of Middleport are right on the ball. They sent 240 fifth and sixth graders on board the Lois McClure on September 9th, which was the day after their classes started! Erick Tichonuk, the schooner’s First Mate, a man of many hats, is in charge of our school programs. He arranges student visits, coaches our crew of amateur teachers, and organizes a smooth flow of students among six teaching stations on board the Lois McClure. His shoreside introduction to each class, as it arrives, is a marvel. In less than ten minutes, he can transform an excited, noisy mob, jumping out of a yellow bus, into a quiet group of youngsters with an appreciation of just how, and how much, the 19th century canal transformed the region of the country that they call home. With chalk, Erick draws a big map on the pavement, and, before they know it, the students are caught up in an exciting story of canal building, water transport of raw materials and finished products, and the growth of cities and towns from New York to Buffalo. 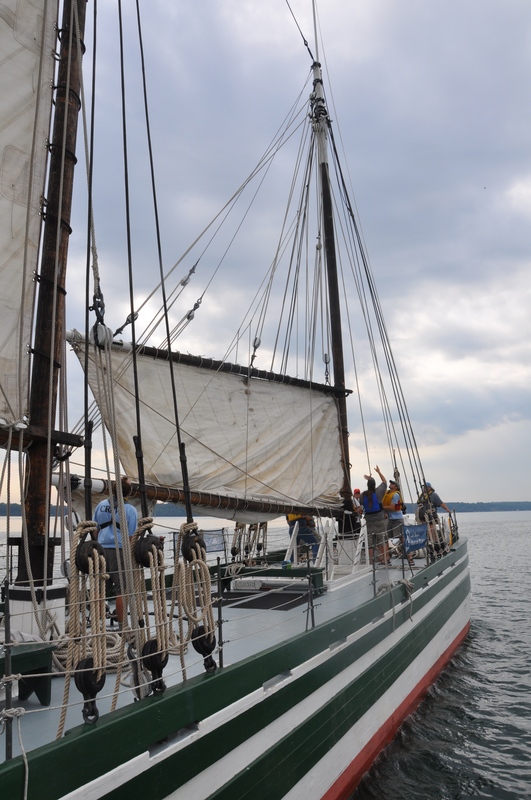 Then they troop on board the schooner to learn details of canal boat operation, specific cargoes carried, and life on board, and also about the historical research, particularly including nautical archaeology, that has made it possible to build a reproduction of a canal schooner of 1862. To Erick and the crew, an immensely satisfying byproduct of our teaching is to witness students bringing their parents and grandparents back on board the schooner and giving them a knowing tour. The Middleport kids came back in dozens. Thank you to the school department of Middleport. Turning the schooner around in the narrow canal at Lockport to start our homeward- bound trip on September 13th presented something of a problem. We could move ahead to a basin at the foot of Lockport’s famous high double locks. Or, we could back down the canal a hundred yards or so to where it widened out a little. Choosing the latter, we went ahead gently against a bow line to swing the stern out into the canal, and backed away from the wall and got the schooner lined up in mid-stream. That seems a funny term to use in a canal, but here there was a knot or so of current caused by the overflow coming down past the high locks. We used the current as well as occasional backing by the tug to work slowly along to where the canal looked wide enough for us to turn around in. Then we used the Oocher to push the schooner’s bow around so that she was heading east. Well, the canal was just barely wide enough for this maneuver. As we turned crosswise, the schooner’s rudder missed one wall by a foot and the bow cleared the other wall by three feet. Mercy. We were off for Rochester to attend (and be a centerpiece for) the 2010 World Canals Conference. On the way, we made overnight stops at Albion and Spencerport. On September 15th, we turned north from the Erie Canal and went down the twisting Genesee River to moor on the long wall at Corn Hill Landing in the Flour City: Rochester. Yesterday, the 16th, we stepped the masts and set up the rigging. It’s true that there is a scant quarter mile of open water for us in the river between bridges, but we just couldn’t resist showing off the schooner for the assemblage of canal experts from around the world.